Today is the Centenary of the start of the Second Battle of Ypres and a hundred years since the first use of poison gas on the battlefields of the Great War. Poison gas was a weapon outlawed under the Hague Convention but by 1915 the Germans viewed the conflict as a ‘Total War’ and that every weapon was justifiable for victory; there was also belief that the Allies had gas weapons too and it was just a matter of time before they were implemented. After much preparations and a trial use of the gas, the poison cloud was released at 5pm on 22nd April 1915. More than 170 tons of chlorine gas was released over a 6.5km front, on positions held by French Colonial and Territorial troops. More than 6,000 of them quickly became casualties, having no protection against the gas. Most died within ten minutes as the chlorine gas irritated their lungs causing a ‘drowning’ effect. 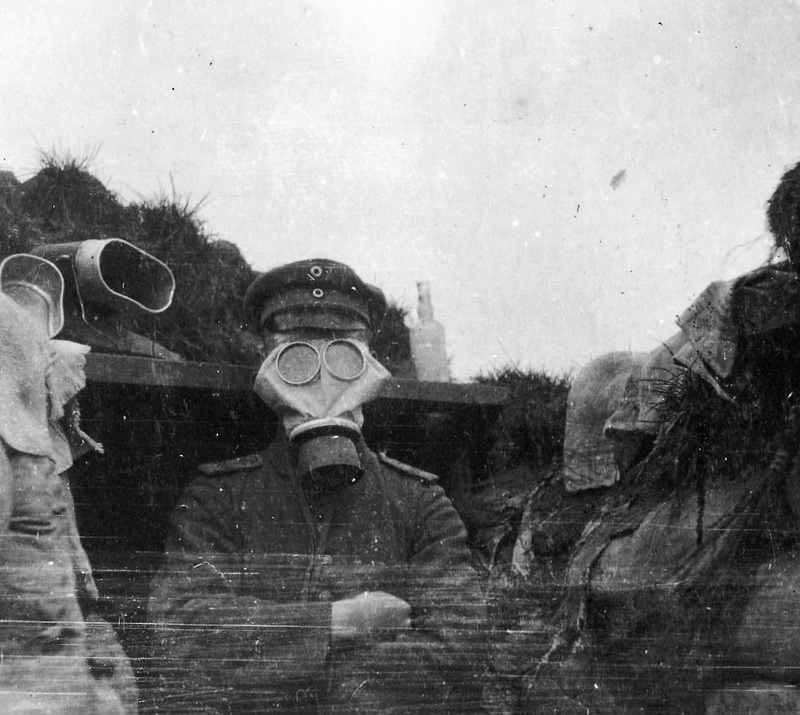 German assault troops came flooding through the French positions, protected by their own gas masks, and gradually the whole front, including the British lines, began to collapse. In the fighting that followed troops of the Canadian Expeditionary Force played a prominent role in the defence of Ypres; the 1st Canadian Division losing more than 2,000 men killed in action in the first days of the battle. 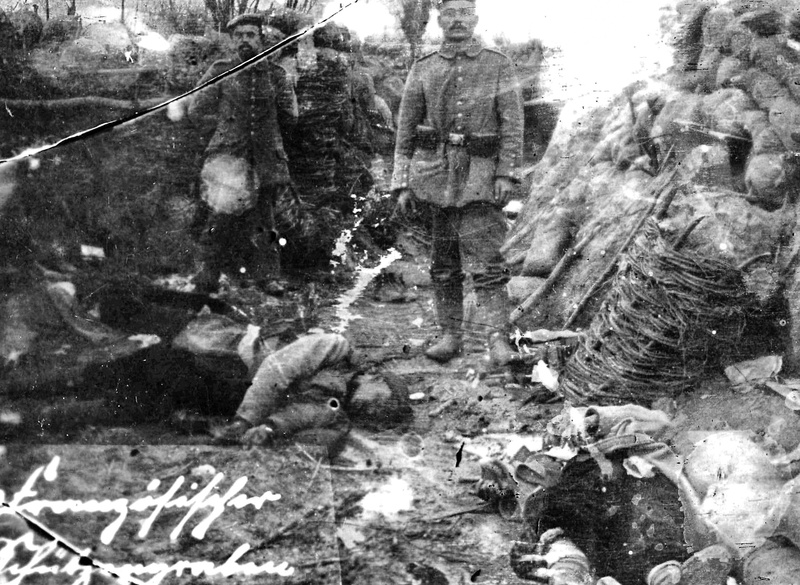 The photograph above is grainy and unfocussed but shows German soldiers in a captured French trench in the opening phase of the battle. Two dead Poilus are on the trench floor, victims of the gas attack which took place a hundred years ago. 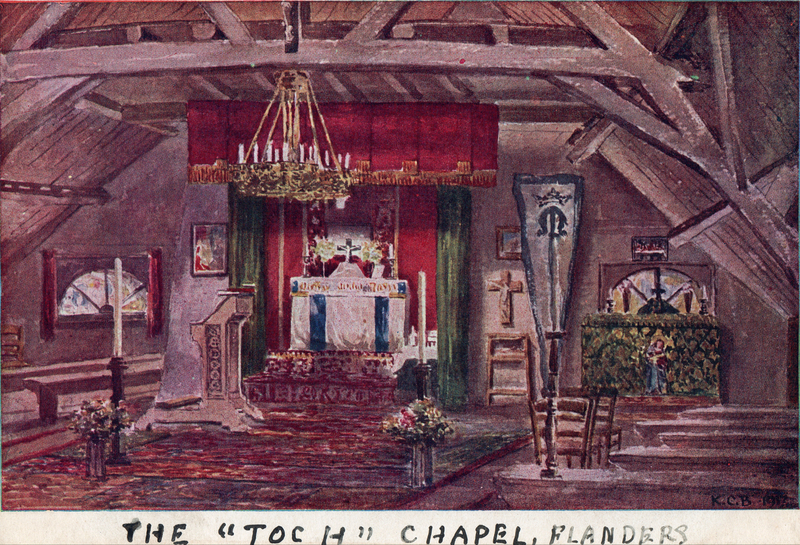 Many thanks to German historian Rob Schäfer for the use of these images. As 2014 comes to an end, it has been a good year for Great War Photos with a huge number of visitors but I am also pleased to have been able to supply photographs for a number of WW1 Centenary projects, exhibitions and publications. But this is only just the start of the centenary and next year on the site there will be photos relating to Neuve-Chapelle, Aubers Ridge, Festubert, Gallipli, Loos and Ypres among many other locations connected with events in 1915. 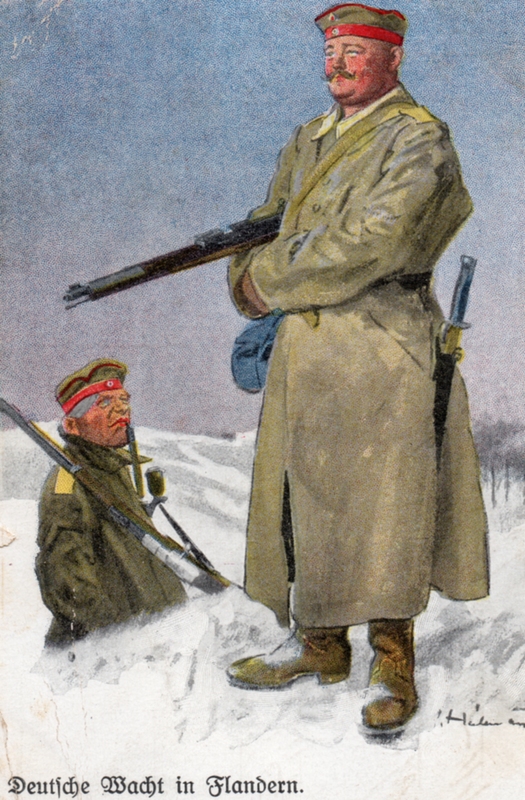 This Christmas Card was sent by a German soldier from Flanders in December 1914 – a hundred years ago this week. Meanwhile have a Happy Christmas and wonderful New Year – see you all in 2015. On this day in 1914 the German Army advanced through the Belgium village of Philippeville en-route to take part in the fighting around Charleroi and later in the Battle of Mons. Five days later the town was the scene of a massacre of more than 130 Belgian civilians, which will be commemorated in a centenary event. This undated photograph seems to have been taken sometime during this period and shows a column of German soldiers on the march. 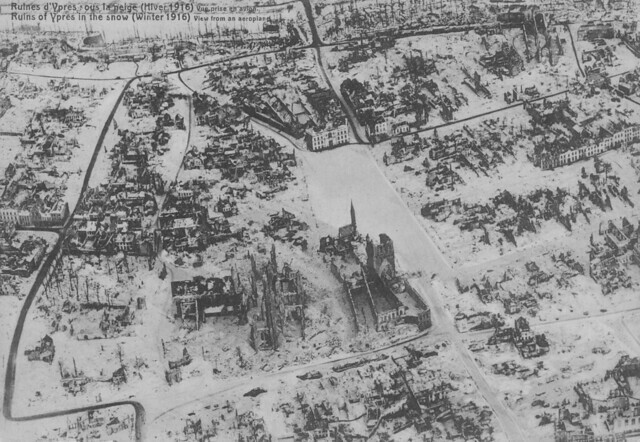 This aerial image dates from 1916 and shows the centre of Ypres around the ruins of the Cloth Hall and St Martin’s Cathedral as it was at that point in the war – but in this case covered in a thick blanket of snow. The main square is in the centre of the photograph and towards the centre top is the road leading up to the Menin Gate and the Ypres Ramparts. It offers a very different and compelling image of Ypres, only half way through the conflict, but yet already very much in ruins. The Western Front at its peak was over 450 miles long, stretching from the Belgian coast at Nieuport to the Swiss border near the village of Pfetterhouse. The terrain along that front varied widely from the flat plains of Flanders to the rolling downland of the Somme, through forests like the Argonne and into mountains when it reached the Vosges. On the Belgian end of the front, at Nieuport, the trench system ran right up to the beach, with that end of the Western Front literally petering out in the sand. For most of the war it was held by the Belgian Army but in 1917 British troops took over the sector in the lead-up to what was eventually an abandoned plan to make seaborne landings further up the coast. However, in July 1917 the Germans went on the offensive here and attacked the forward positions held by British units around the town of Nieuport. This photograph, from a German source, dates from that period and shows an overrun British trench following the fighting in July 1917. 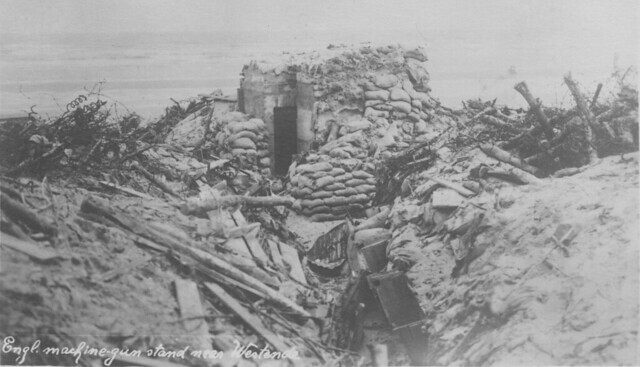 The bunker was in the extreme northern positions on the Western Front and directly overlooked the beach and indeed the sea; both of which are visible in the background on this image. It is probably not how most people think the Western Front came to an end on this Northern end of the battlefield! The Belgian Army in some ways is often a forgotten force in the Great War. Their men fired some of the earliest shots when the Germans crossed the border during the Schlieffen Plan and by the end of 1914 they were holding the Yser Front from north of Ypres to the Belgian coast at Nieuport; positions largely along the Yser Canal. 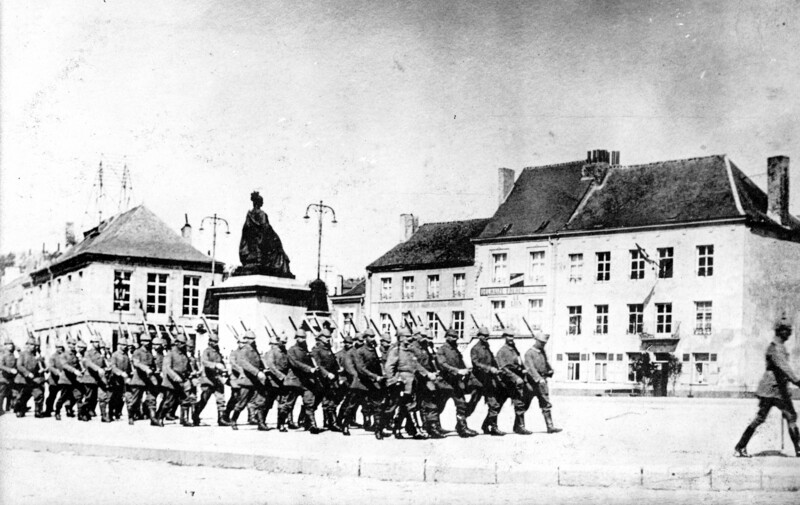 By 1918 more than 30,000 Belgian soldiers had died in the war. 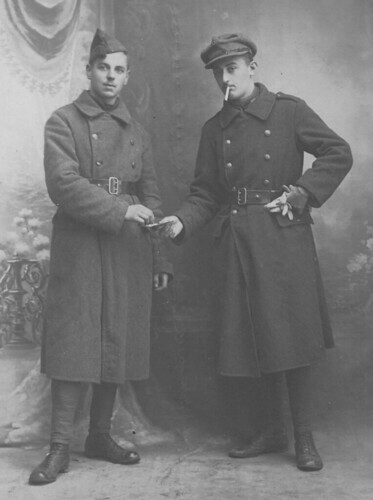 This image from the winter of 1917 shows two Belgian soldiers equipped for the cold, dressed in their greatcoats. After 1914 much of the Belgian Army equipment was supplied by Britain and the Belgians began to wear a uniform that was a variation of the some of the British designs as all their factories had been overrun by the Germans. But their headgear was always distinctive, as seen here.